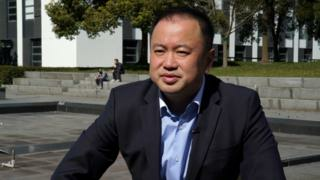 "A couple of years ago one of my IT managers copied ten thousand pages of my entire company's profile," Frank Liu told me. His company Intco has been around for 25 years. He told me the stolen download included "our technology information, our customer list, our purchasing and supply information. Everything." "We actually have the record of how he stole it," Mr Liu told me. "He just sold it to establish another company, as his investment." China now has specialist IP courts, albeit - like every aspect of the judicial system - subservient to the ruling Communist Party. They are supposed to settle cases within 12 to 18 months. Chinese business figures like Mr Liu have also called for the country's legal system to better protect the innovators and entrepreneurs who have turned China into much more than the "copycat" economy it was once labelled. Foreign firms are just as likely to win a case - a good case, Mr Qiu added - as domestic plaintiffs. In the past few years Lego and New Balance have both won high-profile cases against copycat manufacturers. The Foreign Investment Law states that the transfer of technology from foreign investors to any domestic partner must be voluntary. China has always defended this highly contentious practice by insisting it's part of an agreed commercial arrangement. Now though comes the hard part - enforcement. Mr Qiu told me the next step is "detailed regulation coming out after this law, and we want to see actual cases in local courts and also from enforcement agencies." If that follows, then he thinks "potentially the foreign IP owners will have more to protect [them] in China." A fruit industry executive recently told me his firm wanted to buy new conveyor belts for their farms in China, but the European manufacturers said no. They feared their systems would be copied here, and they'd be wiped out. Mr Liu can't do that. He is Chinese and wants to stay in China. But he has taken steps to try to prevent another IP theft. He is chief executive of the company he founded, but this year he told me he's changing his title to include head of research and development. Because he can't trust anyone else with the firms' commercial secrets. Protecting original ideas, techniques and information in China - "it's a human right" he told me.